I got to see We Juke Up In Here! over the weekend (if you haven't seen, you must) and we will be discussing it in depth in a couple of weeks, along with a couple of other DVD's I've recently seen. In the past, we've discussed a few blues documentaries that are among my favorites (Deep Blues, Last of the Mississippi Jukes, M for Mississippi, the American Folk Blues Festival series, etc....), but there are many more of these movies available for viewing, some that cover performances, some that serve as biographies, some that help to familiarize viewers with previously unknown or seldom-heard artists. This week, Friday Blues Fix will look at a few of our favorites. Please keep in mind that this is by no means a comprehensive list....in other words, if you don't see your favorite on here, there's a good chance I haven't seen it yet, so feel free to mention your favorites in the Comments section below if you don't see it here. Muddy Waters: Messin' with the Blues - For starters, this title is a bit misleading. 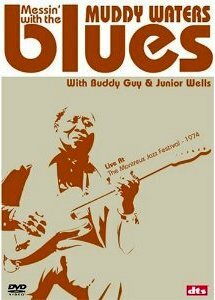 If you read the smaller print below the title, you will see "With Buddy Guy & Junior Wells." When I picked this up on VHS in the early 90's, when it was available from Rhino Video, the trio actually split the bill, with all three appearing on the cover. This video was taken during Guy and Wells' classic 1974 show at the Montreux Jazz Festival, which was also the setting for the pair's CD, Drinkin' TNT & Smokin' Dynamite. In fact, Waters only appears for the last three or four songs. Junior Wells is in great form, blasting through "Messin' with the Kid," and then taking his sweet time with a classic take on "Hoodoo Man Blues." Buddy Guy gets a vocal turn as well with two of his old favorites, "Ten Years Ago" and "When You See The Tears From My Eyes." His guitar work is exquisite on all of these tracks, with very little of the Hendrixian influences that he often came to depend on too much in future years. Waters comes out for the final tracks, which will please all his fans. He seems particularly inspired on new versions of "Hoochie Coochie Man," "Mannish Boy," "The Same Thing," and the rousing closer, "Got My Mojo Working." The backing band is pretty darn good, too, with Pinetop Perkins (looking very youthful in his mid 50's) manning the keys and Rolling Stone Bill Wyman on bass. I can't remember the other two band members....I think it was Terry Taylor on guitar and maybe Dallas Taylor on drums), but they did a nice job backing the trio and laying down that steady rhythm. This is not what you would call an essential set, but it's a nice, steady set that is worth hearing from start to finish. I like it because it's a nice glimpse of Guy and Wells working together as front men and their respectful backing of Waters, who really impressed me with his regal confidence. If you can find this one, you will enjoy it. I think I've shown this clip before (Guy and Wells, from the movie, doing "Messin' with the Kid"), but it's one of my favorites of the two of them and captures their exuberant spirit and intensity perfectly. 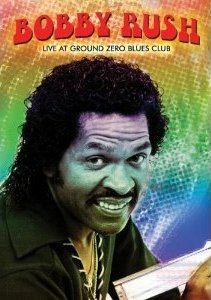 Bobby Rush: Live at Ground Zero Blues Club: Believe it or not, before I got this DVD/CD set, I had never seen Bobby Rush perform. Oh, sure I had heard about him and heard his songs on the radio, but I had never seen the man himself in person. Let me just say this....all the talk you've maybe heard over the years, about what a great performer and showman he is and how he can hold the audience in the palm of his hand........it's all true and the only proof you will ever need is this DVD. Performing with a TIGHT band (which includes current soul blues sensation Stevie J playing some searing lead guitar) and his usual dancing ladies of varying shapes and sizes, Rush nearly tears the roof off the sucker as he romps through a mix of his classic tunes ("Sue," "I Ain't Studdin' You," "What's Good For The Goose," "Chicken Heads") and a great mix of new tunes and covers. The set was originally released as a DVD/CD set, but is now widely available as a DVD only. The DVD is really what you need though because as good as Rush is on the audio side, you definitely need the video side to really capture what he's all about. Still going strong today well into his mid 70's, Rush is probably one of the most underrated bluesman of his time, but those who do know him love him. If you're not familiar with him, take the time to check him out for yourself. 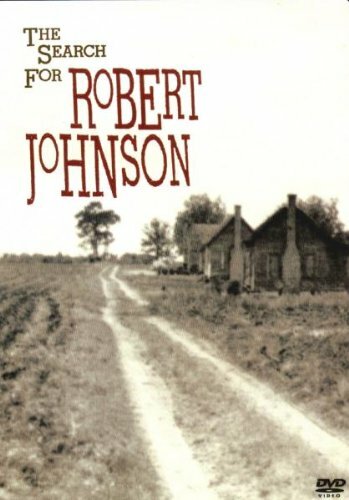 The Search For Robert Johnson: John Hammond, Jr. hosts this informative documentary about the legendary Delta bluesman. Hammond interviews two of Johnson's fellow travelers (Johnny Shines and Honeyboy Edwards, who shows the house where he claims Johnson died), one of his old girlfriends who claims she knows where he's buried, and there's also commentary by Keith Richards and Eric Clapton, and Johnson expert Robert "Mack" McCormick. There's also an interview with Claud Johnson, who claimed to be Johnson's son (and was later proved to be in the courts in 1998). However, the most poignant moment of the film comes when Hammond interviews Willie Mae Powell, another former girlfriend. Johnson calls out for her on the song, "Love In Vain." When Hammond plays the record for her....she's hearing it for the first time.....she is visibly surprised and moved by it. This movie came out in the early 90's, around the time that Johnson's sides were repackaged into the best-selling box set and his popularity was as great as it had ever been. There was a lot of new information that was revealed in this movie, most of which is now common knowledge for a lot of blues fans. Still, it's worth seeing. Hammond does a great job as host...he plays many of Johnson's songs and even gets into an old-fashioned "head cutting" with Shines. 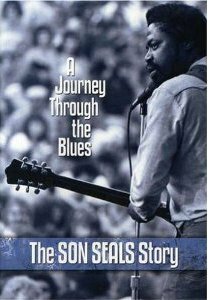 Journey Through the Blues: The Son Seals Story: I received this in the mail for review and had no idea it was coming. What a nice surprise....Son Seals is one of my favorite blues men with his raw, visceral guitar and roaring vocals. This 2007 DVD serves as a video biography for Seals and features interviews with his son, Koko Taylor, Lonnie Brooks, Steven Seagal, Dr. John, Bruce Iglauer, and Seals himself. Although I love this DVD, there are a couple of minor complaints.....it's a little short and there's only a few performances throughout that have sound. Part of the DVD's extras are three live performances from Seals at various stages of his career. While they are all great, it would have been great to have more. Maybe more will be uncovered in the near future. Anyway, this is a very informative film that sheds new light on one of the modern era's icons. 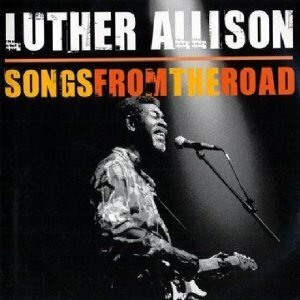 Luther Allison - Songs From The Road or Live in Paradise: I'm listing both of these because Live in Paradise is probably THE Allison DVD to get, but it's out of print and pretty hard to find without refinancing your house or something. Songs From The Road does have its merits.....it's an exceptional performance, it's well-filmed, the sound is fantastic, and there's a 20 minute interview with Allison and an excerpt from an upcoming documentary included.....but the concert on DVD is only seven songs and about 50 minutes long, where the performance on Live in Paradise is over 2 1/2 hours long. Songs From The Road is a set recorded in Montreal just a couple of days before Allison was diagnosed with cancer, but you'd never be able to tell Allison was sick based on his performance. The reason for the brevity of the performance is because the concert was edited to fit an hour format on CBC. The good thing is that the CD that comes with the DVD contains all the music from the performance, so you do get the entire show, and what a show it was! 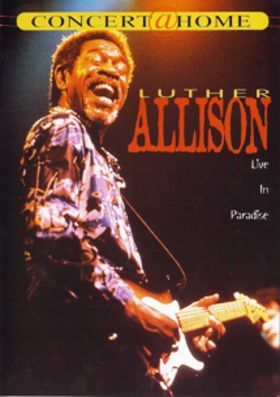 Live in Paradise was recorded in the Spring before Allison's death and is an awe-inspiring performance. Allison's boundless energy and intensity never lets up for a moment during the show. This is by far the best video capturing Allison in his element, but due to the potential financial considerations, there's not a thing wrong with settling for Songs From The Road. Luther Allison never gave anything less than 100% on any performance. That's all for now. We will revisit this topic in the near future. FBF would love to hear what some of your favorite blues DVDs are.